As many as 14 people were hurt and two are in critical condition after calls flooded into 911 with reports of multiple people stabbed. NBC's Janet Shamlian reports. At least 14 people were hurt Tuesday in a stabbing spree at a Texas community college apparently carried out by a student who was later taken into custody, authorities said. At least two victims were in critical condition. It was not immediately clear how severe the other injuries were. The stabbing happened at the CyFair campus of Lone Star College, in the Houston suburb of Cypress. 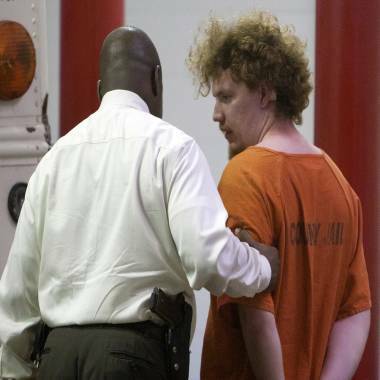 Dylan Quick, right, a suspect in the multiple stabbings on the Lone Star CyFair campus, is escorted by a Harris County Sheriff's Office investigator on Tuesday. Law enforcement officials have identified student Dylan Andrew Quick, 20, as the suspected assailant, and the Harris County District Attorney's Office has filed three charges of aggravated assault with a deadly weapon. Bond has been set at $100,000 for each charge, but more could be filed, officials said. Quick used a "razor-type knife" in the attack, according to a statement from the Harris County Sheriff's Office. He told authorities he had fantasies of stabbing people to death since he was in elementary school, and indicated he had been planning the attack for long period of time. The school said the attack happened “in and around” its health science building. Memorial Hermann Texas Trauma Institute said it had two patients in critical condition and six in all, including four flown there by helicopter. Three patients were upgraded to good condition Tuesday evening and one had been discharged. A spokeswoman for another hospital, North Cypress Medical Center, said it had taken six stabbing victims who were in stable condition. Two other victims were treated at the scene and declined to be taken to the hospital, the sheriff said. The school closed for the day and ordered students to find shelter somewhere safe. Campus police caught the suspect, the Harris County Sheriff’s Office said. The school will open Wednesday for regularly scheduled classes. Counselors will be on hand to speak with students and employees. The stabbing happened just after 11 a.m., a college official said. The school had warned students that a second suspect might be at large, but sheriff’s officials said later that they believed they had the only suspect in custody. Lone Star College student Kayla Brightkrite was walking down an empty hall on her way to class Tuesday when a teacher quickly pulled her into his classroom, she told NBC News in an email. 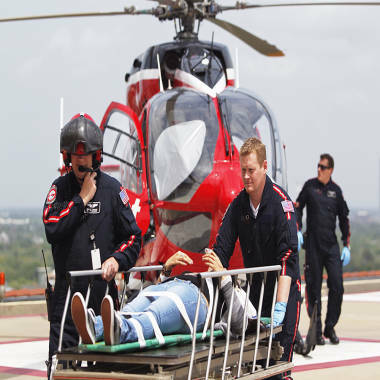 Life Flight personnel rush a stabbing victim off a helicopter at a Houston hospital after a stabbing spree Tuesday near Lone Star College in Cypress, Texas. She initially had no idea an attack had taken place until other students quietly huddled in the room told her. "I asked a guy what was going on and they said a kid had just been stabbed in the neck down the hall from them and they heard someone scream, 'Oh my God! Call 911!'" she recalled. Brightkrite stayed in the classroom for nearly 45 minutes until school officials said they could exit out the back of the building. In January, three people were shot at a separate campus of the same college. A federal official said that those shootings appeared to be gang-related. A 22-year-old man was charged with aggravated assault. The Lone Star system of colleges has 90,000 students in all.